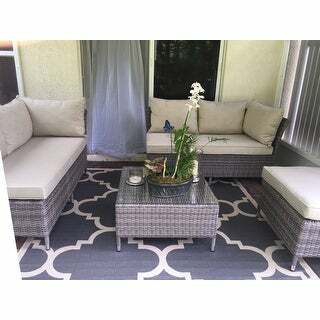 Loved the patio set and I get tons of compliments on it. We are selling our home and the buyers offered to buy it from us. We are NOT selling. Love this item. 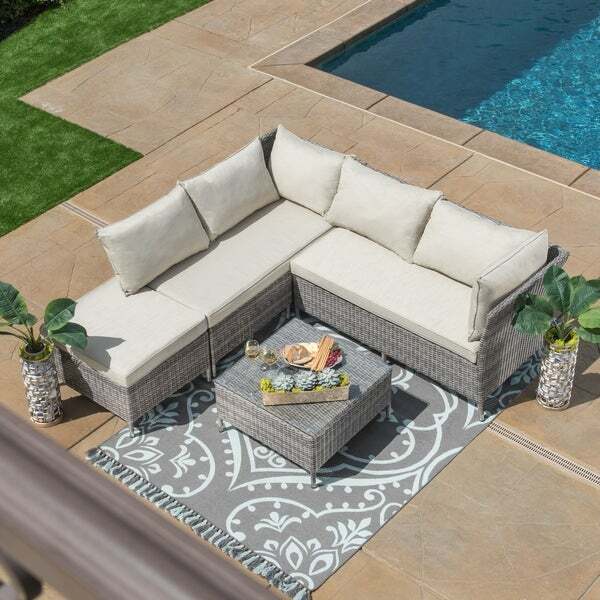 Bring a breezy and beautiful accent to your patio or poolside with this sleek and sumptuous Bellanger 4-piece furniture set by Corvus. The beige cushions resist fading for years of lovely comfort, and the robust wicker weave lends a resilient look to any area. 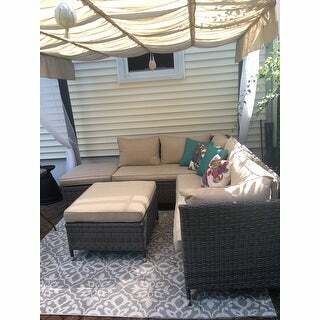 I just received this Patio Set 2 days ago. It arrived with White Glove Service from O.com. The delivery men were on time & nice. They put the Box by my patio so I can easily place furniture outside. When I opened the Box I was thrilled! So pretty & all pieces were completely together & ready to put on patio! Except, for the larger couch. I put the couch together with the 9 screws, washers & "L" shaped screwdriver! Super Simple! Took 1 hour for me to put together. I took my time to make sure all screws were tight & aligned properly! I don't know how durable the furniture will be or how it will handle the weight of several people sitting on it yet. But, it appears to be well made & sturdy. 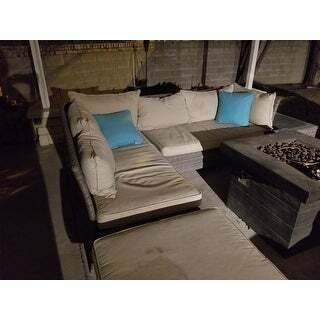 Please Note: the fabric of the seats & pillows is darker than the picture on Overstock. Com. The fabric is more of a light tan or taupe than the whiter/dove grey color that is pictured on the website. Personally, I am happier with the darker color. 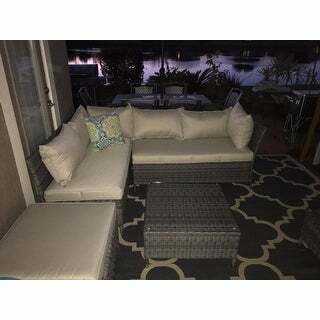 But, if you are looking for a white couch & patio furniture.... This is not it. The rattan/ wicker is a light-med grey! Beautiful! Check out my pic! 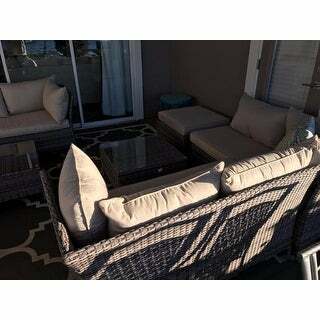 If you purchase I hope you Love this patio set as much as I do! Also, the furniture is light enough to move around easily for different configurations & you can't beat the price! I love the classy grey wicker color and neutral cushions (that can be removed for washing). You have the option of using one ottoman as a coffee table with a glass tabletop, but an extra ottoman cushion was included in the shipment. It was fairly easy to assemble by myself (about an hour). The only reason I didn't give a full five rating was the comfort level of the cushions. 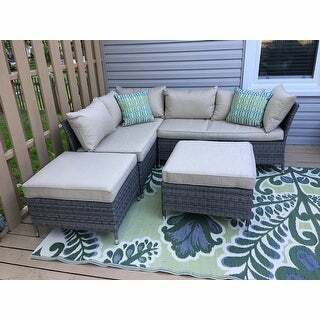 This is a great value for a conversation set that can be arranged in multiple configurations. Overall, I am very pleased with my purchase. Very attractive set for the price....one leg was approx 2 inches shorter that the others. I am so happy with this set! We are enjoying spending time on this set. It is a beautiful neutral gray. We have it under a pergola that is not 100% waterproof. It's been rained on & the fabric dries well & doesnt stink after it dries. We get so many compliments. The only thing you should be aware of is that the cushions arent thick so went you sit down the first time, you feel the wicker beneath you. I got used to it & am very comfortable. I love stretching my feet & taking a nap outdoors. We have only had this for two weeks, but I'm impressed with quality and look. I shopped around for hours, and this is a great value. It was delivered in one week. Easy to assemble. The cushions are comfy and zip off for easy washing. Very excited to have this sofa! Arrived fast and without damage. Nice and light piece of furniture. Great quality. Well made. The only problem is because of the missing arms. Its very hard to arrange it any other way than the L shape. Table include cushion that we use as extra ottoman which works great. I have washed the cushion covers without any problem when placed back on cushion. OVerall a great buy but not easy to reconfigure again. I love the flexibility of this patio set. Super easy to setup, seat cushions aren't super thick but they do the trick. The ottoman/table is super versatile, the set comes with glass for the table and a cushion to make it another seat, you can also make it one big square bed! We purchased this for our rental cottage. 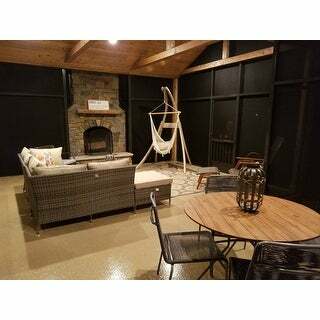 We wanted patio furniture that was good quality and reasonably price. This set was perfect for us. We did not find it difficult to put together. We give a 4 star because it was comfortable but not 5 star comfortable. Love it, but...one of the metal tabs was broken and bent. I just called customer care and spoke with hands down THE best customer service rep I've ever dealt with!! Kudo's to her! Wish I could remember her name. Nice, nice person. The set is as pictured, it's very light weight so I worry about it in a storm, that might be tested tonight. It was very easy to assemble. It came pretty much already put together which was a plus. Cushions are the color I expected, they are thin, but comfortable. Again, I'm not sure how they will hold up. It fits perfectly on a small deck/patio. Overall I like the piece but I do think it is overpriced and I got it on sale. It's made of plastic, around metal. I'm guessing this won't weather well in the midwest so we will need to store indoors. I think it should probably be closer to *** price point. The quality if great and was very easy to assemble. The cushions and pillows have just the right amount of loft. We really like the fact that you can arrange the pieces several different ways. I placed this order over 2 months ago and just now received my package after spending countless hours with Overstock and the freight company only to receive a highly damaged product. Overstock will do nothing regarding a refund or return since I am past the "return window" policy even though it took 2 months to deliver. I will never use overstock again! I bought 2 of these sets and they look great. They offer lots of seating and seem sturdy enough. 2 of the back cushions do not match the others but it's hard to see the difference unless you are really looking. They also didn't come with the little rubber pieces to connect the different sections. It is a very versatile set as they can be arranged in different ways and the color is classy and elegant. 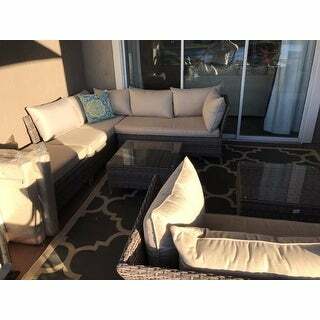 For the price definitely a nice looking set...have gotten many compliments....like the fact that covers are removable to wash.
Our couch set is beautiful, but it didn't come without flaws. The bottom covers for the feet of the couch were stripped and we didn't receive ANY hardware. My husband had to go to *** and find bolts and screws. Unfortunately none of them fit the sizes, because they come in millimeter sizes from China! Luckily we were able to find a way to put it together by using smaller sized screws and zip ties. Sadly, we had already waited several weeks for it to arrive, that we didn't want to wait another few weeks for hardware. Texas doesn't get much of a Spring and we had anticipated using it immediately. Think before you purchase - there are many cheaper options that are probably the same quality and less hassle. 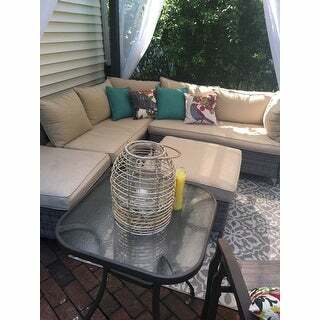 This outdoor sofa is great fits in the space perfect and comfortable also did not require me to have much to do in putting together. It's a nice set. Good size and looks sturdy. Easy to wash. But it is very light, which is a surprise to me. It may fit better if you are looking for a piece to be put against wall. I do like to look of this set. Attachment was also easy as long as you have help. However, the pillows due fade fast in sunlight and the covering on the pillows makes it slippery to sit on. I've had this patio furniture for about 2 years. The cushions are starting to sink a bit and you can tell where I always sit. The cushions also slide and I have to reposition them to the correct spot occasionally. It was easy to assemble. I haven't tried cleaning it yet, but for the price I paid I think I might find something with different cushions. Very light weight, but sturdy. It has been out in the elements and still looks great. Very comfortable as well. Highly recommended! Waited forever for this order and the weave is so crooked it looks awful... the seats are doable but none too deep. "I have a narrow spiral staircase that leads to the roof deck. I wonder if the loveseats arrive unassembled and if they will fit in the staircase. The staircase is 26 inches wide. Height will probably not be an issue." "Is the resin used for the wicker High Density Polyethylene or PVC?" The resin wicker is made of high density polyethylene. "How much weight can the sears hold? " The seat can hold up to 300 pounds. "Is the fabric dyed before it is spun or after? Is is mold and mildew resistant?" "OK, this is 9/17/17 ... can I get the covers in blue or navy? Beige is just so ... beige." Unfortunately this set does not come with blue or navy covers. You may enjoy item 19777395, 19442343, and 23421711, which are crafted from grey wicker and come with blue covers. "Are there other pieces available that match this set, i.e. chairs?" Unfortunately, we do not have any coordinating pieces for this set.